Book Your Stay In One Of Our Elegant North Conway Hotel Rooms! All rates include Dinner and Breakfast! It's Like Your Room is FREE! 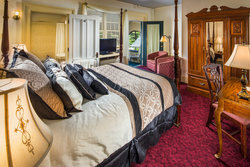 Each one of our stunning North Conway hotel rooms were designed as an elegant escape for guests looking to indulge in a classically luxurious atmosphere. 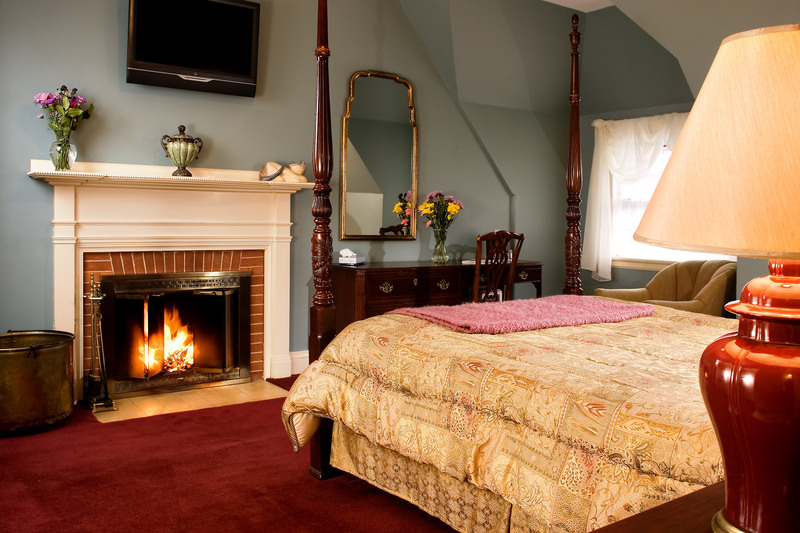 Our North Conway hotel rooms feature lavish amenities like Jacuzzis, fireplaces, mountain views and opulent bedding, making Stonehurst Manor the ideal place to stay on your visit to North Conway. The moment you step onto Stonehurst Manor’s sprawling estate, you can’t help but feel a sense of peaceful serenity wash over you. Nestled beneath towering pine trees and removed from the hustle and bustle of a big city, Stonehurst Manor is the ideal place to indulge and rejuvenate. Our grand Manor features 26 rooms, 16 in the Manor and 10 in the Mountain View Wing, each designed to ensure each guests can feel at home amidst the luxurious amenities. Spend a romantic weekend in one of our Fireplace & Jacuzzi rooms, all equipped with a deluxe four poster bed and other luxurious amenities. 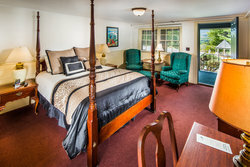 Additionally, our Mountain View rooms offer a spectacular look at the gorgeous White Mountain range. If you want a more spacious place to stay, reserve one of our condos for some of the most lavish White Mountain accommodations. 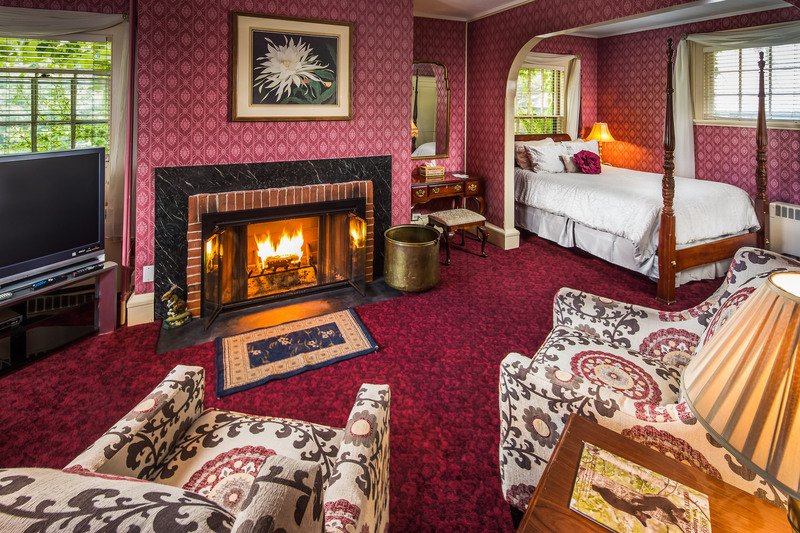 Each room price includes breakfast and dinner at our world-class Wild Rose Restaurant. Serving up the most delightful dining options in North Conway, Our Italian inspired New Hampshire restaurant is popular with locals and guests a like. Dine on fantastic local New Hampshire fare and enjoy our fresh baked breads and pizzas. 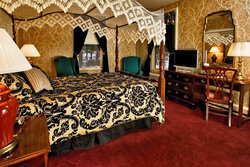 Our North Conway hotels rooms allow guests a chance to truly experience 19th century elegance in a modern environment. Close to a number of North Conway attractions and activities, Stonehurst Manor is the perfect location to begin your New England adventure. Bringing your furry friend along for a vacation? 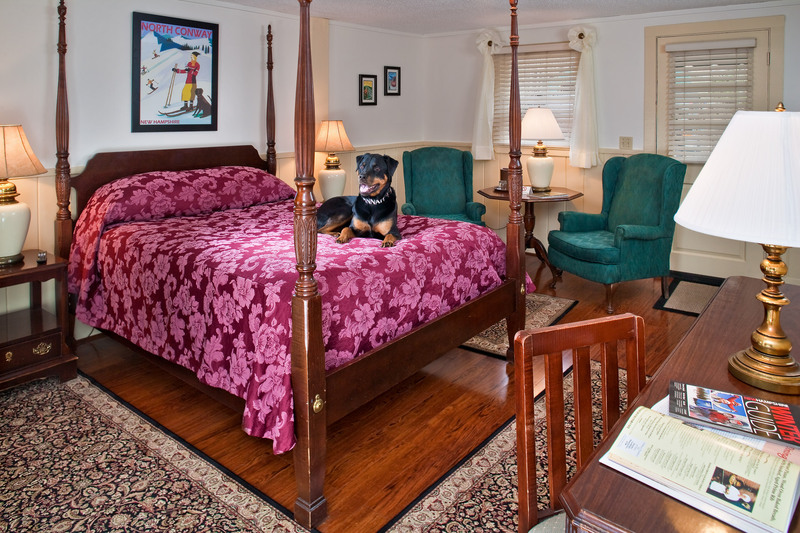 Our pet-friendly North Conway hotel offers guests travelling with their pets special rooms, and even offers special treats like our signature pet bowls! Originally built in 1874, each room of Stonehurst Manor is fit for a king. 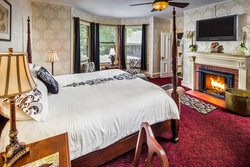 Guests will enjoy the serene elegance and unique feel to each individual room, while enjoying our modern amenities like a deluxe swimming pool, hot tub and flat screen TV’s in each room. 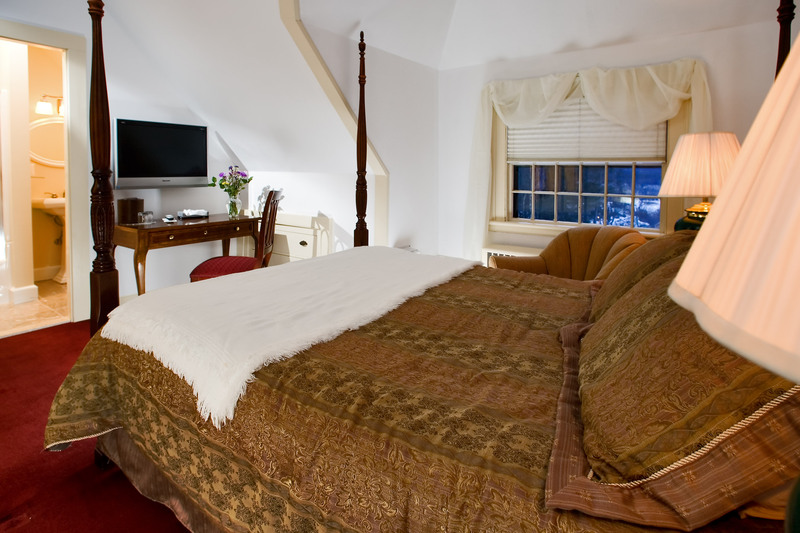 Book your stay in one of our luxuruious hotel rooms in North Conway to begin your elegant getaway today! 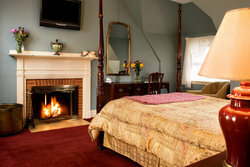 This Manor deluxe room has a king-size four-poster bed in front of a wood burning fireplace. A flat-screen TV is mounted above the mantel. The newly renovated private bath has a Jacuzzi, shower, and wall-mounted flat screen TV. Room size is 405 square feet or 47 square meters. 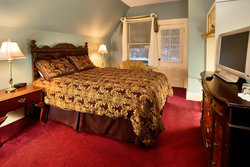 Nightly rates for two include dinner and breakfast. Midweek (Sun. – Thurs. ): $216. Add $30 per night during foliage. Manor’s Best Buys – 3 Nights or More Midweek: $206. Weekend (2-night minimum): $256. Add $40 per night during foliage. Holiday Weekends (3-night minimum): $266. Add $30 during President's Day & Columbus Day Weekends. Add $50 for New Year’s Eve. Room 20 is on the second floor. There is no elevator service available. but assistance with your luggage is available upon request at the front desk. This room has 1 queen-size bed in an alcove w/ a flat-screen TV. There is a sitting area w/ another TV (52 inch) in front of a fireplace. The bathroom has a Jacuzzi w/ a separate shower & a 3rd wall-mounted TV. Room size is 395 square feet or 37 square meters. Weekend (2-night minimum): $256. 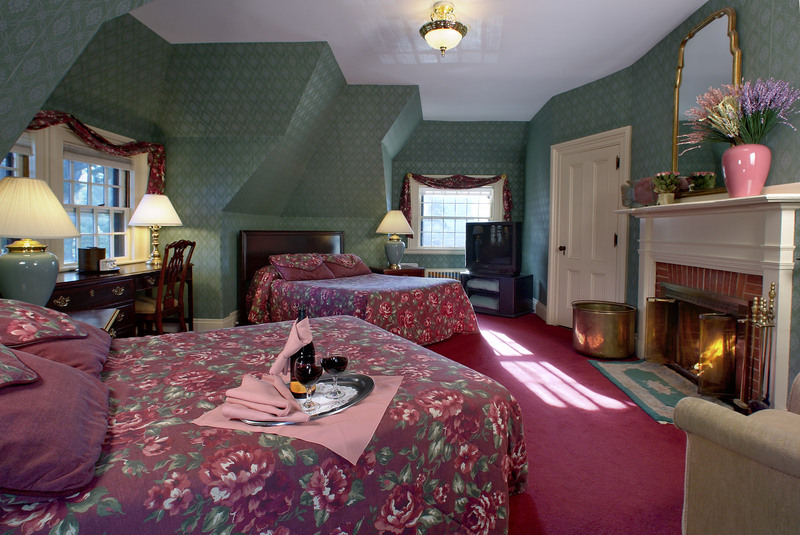 Add $40 night during foliage. Room 21B is on the second floor. There is no elevator service available, but assistance with your luggage is available upon request at the front desk. This large Manor deluxe room has a queen-size four-poster bed in front of a wood burning fireplace and a sitting area with a queen-size sleep sofa. Large windows have a view of the Moat Mountain Range. 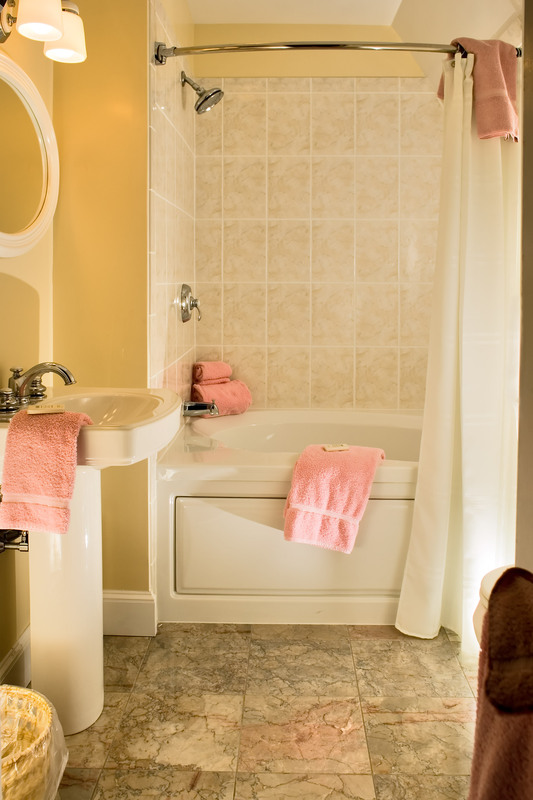 The newly renovated private bath has a Jacuzzi, shower, and wall-mounted flat-screen TV. Room size is 450 square feet or 42 square meters. Room 22 is on the second floor. There is no elevator service available, but assistance with your luggage is available upon request at the front desk. This Manor deluxe room has a queen-size bed in front of a wood burning fireplace & sitting area with a queen-size sofa bed. 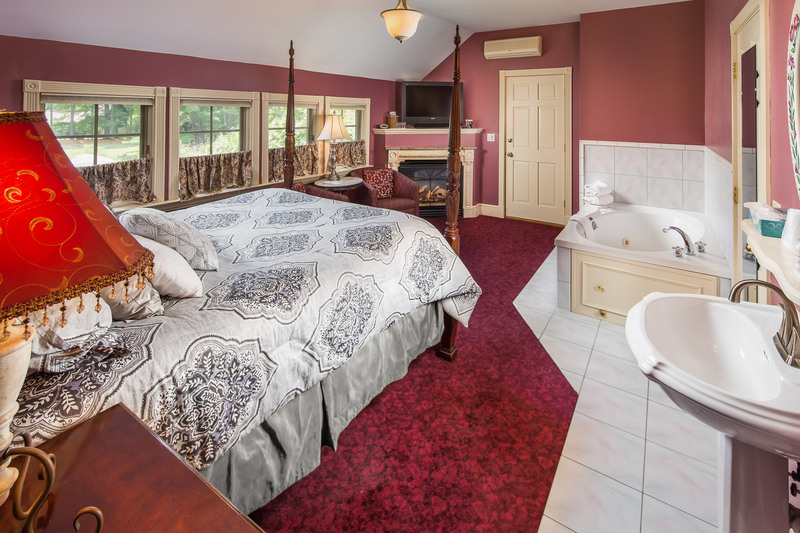 The renovated private bath has a Jacuzzi, shower, & flat-screen TV. The room also has a private screened-in balcony overlooking the Moat Mountain Range, swimming pool & gardens. Room size is 450 square feet or 42 square meters. Room 23 is on the second floor. There is no elevator service available, but assistance with your luggage is available upon request at the front desk. This Manor deluxe room has a queen-size four poster bed in front of a gas fireplace and a Jacuzzi. The private bath has an extra large shower. This room offers views of the front of the property. Room size is 278 square feet or 26 square meters. Room 25 is on the second floor. There is no elevator service available, but assistance with your luggage is available upon request at the front desk. This Manor deluxe room has one queen-size four poster bed in front of a wood burning fireplace, flat-screen TV, and sitting area. A large floor-to-ceiling picture window has a view of the grounds behind the Manor. The newly renovated private bath has a shower and tub. Room size is 333 square feet or 31 square meters. Midweek (Sun. – Thurs. ): $196. Add $30 per night during foliage. Manor’s Best Buys – 3 Nights or More Midweek: $186. Weekend (2-night minimum): $226. Add $40 night during foliage season. Holiday Weekends (3-night minimum): $236. Add $30 during President's Day & Columbus Day Weekends. Add $50 for New Year’s Eve. Room 32B is on the third floor. There is no elevator service available, but assistance with your luggage is available upon request at the front desk. 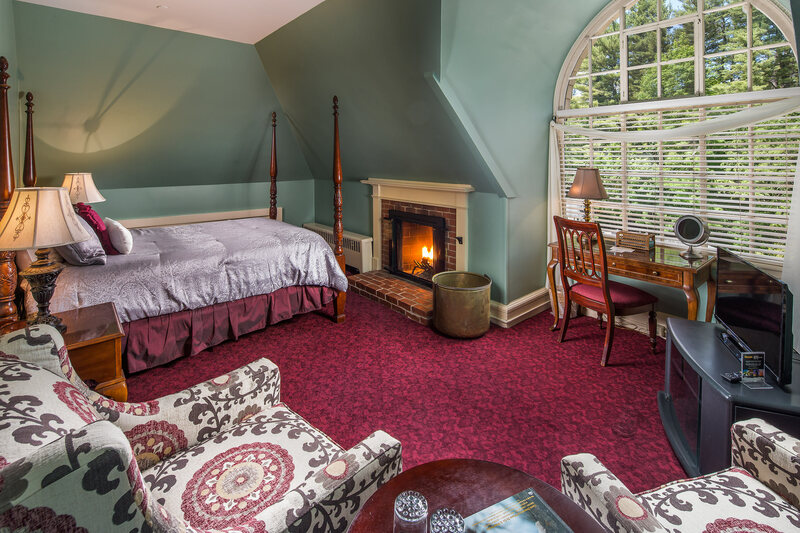 This Manor deluxe room has one queen-size four-poster bed in front of a wood burning fireplace and a view of the Moat Mountain Range. The newly renovated bathroom has a shower and tub. Room size is 278 square feet or 26 square meters. Weekend (2-night minimum): $226. Add $40 night during foliage. Room 34 is on the third floor. There is no elevator service available, but assistance with your luggage is available upon request at the front desk. 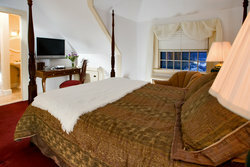 This Manor deluxe room has two double beds in front of a wood-burning fireplace and views of the front gardens. The newly renovated bath has a shower and tub. Room size is 334 square feet or 31 square meters. Room 35 is on the third floor. There is no elevator service available, but assistance with your luggage is available upon request at the front desk. 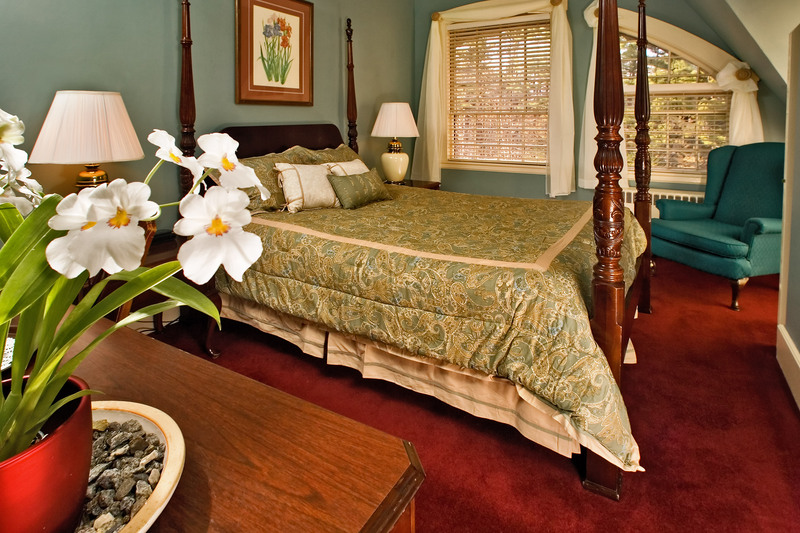 This Manor deluxe room has a queen-size four-poster bed, flat-screen TV, and private screened-in balcony overlooking the Moat Mountain Range, the swimming pool, and the gardens. 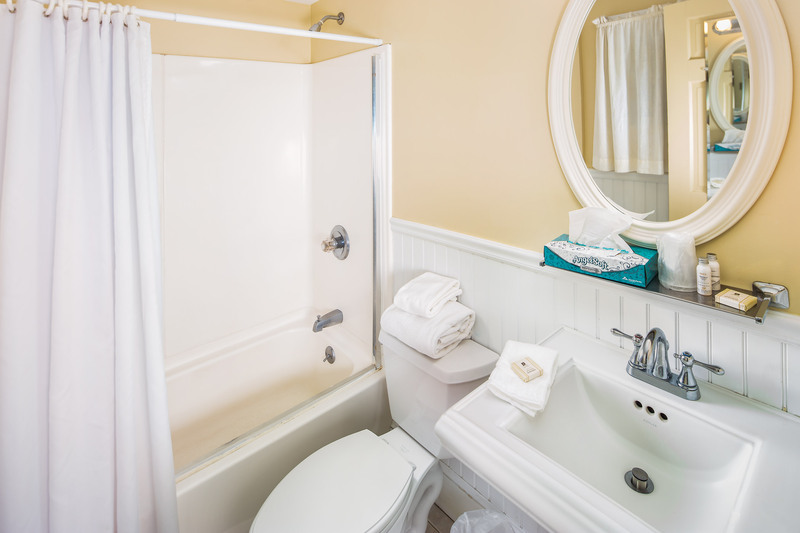 The newly renovated bath has a Jacuzzi, a shower, and a wall-mounted flat screen TV visible from the Jacuzzi tub. Room size is 270 square feet or 25 square meters. Room 21A is on the second floor. There is no elevator service available, but assistance with your luggage is available upon request at the front desk. This Manor deluxe room has one king-size bed in front of a flat screen TV, a Jacuzzi, and views of the Moat Mountain Range. The newly renovated private bath has a shower. Room size is 320 square feet or 30 square meters. Room 33 is on the third floor. There is no elevator service available, but assistance with your luggage is available upon request at the front desk. This cozy Victorian-style room has one queen-size bed in front of a flat-screen TV and a private screened-in balcony with a view of the front Manor gardens. 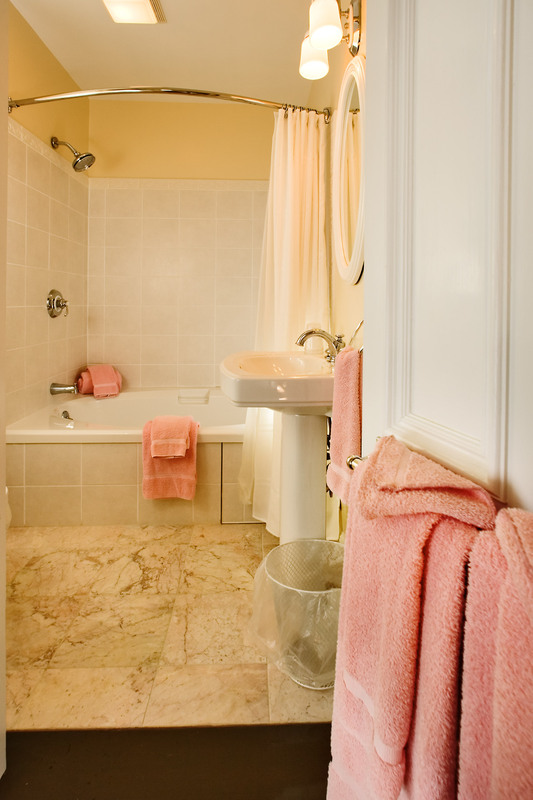 The newly renovated private bath has a Jacuzzi and a wall-mounted flat-screen TV. Room size is 187 square feet or 18 square meters. Room 36 is on the third floor. There is no elevator service available, but assistance with your luggage is available upon request at the front desk. This room has one queen-size bed in front of a flat-screen TV and a Jacuzzi. The newly renovated private bath has a shower only. This room does not offer a view. Room size is 227 square feet or 21 square meters. Midweek (Sun. – Thurs. ): $196. 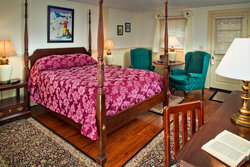 Add $30 per night during foliage season. Holiday Weekends (3-night minimum): $236. Add $30 on President's Day & Columbus Day weekends. Add $50 for New Year’s Eve. Room 37 is on the third floor. There is no elevator service available, but assistance with your luggage is available upon request at the front desk. This Manor room has one queen canopy bed with a Victorian lace canopy, a flat screen TV, two chairs, and a view of the front gardens. The newly renovated private bath, located across a shared hallway, has a Jacuzzi with shower and a wall-mounted flat screen TV. Room size is 215 square feet or 20 square meters. Midweek (Sun. – Thurs. ): $176. Add $30 per night during foliage. Manor’s Best Buys – 3 Nights or More Midweek: $166. Weekend (2-night minimum): $186. Add $40 night during foliage. Holiday Weekends (3-night minimum): $196. Add $30 during President's Day & Columbus Day Weekends. Add $50 for New Year’s Eve. Room 24 is on the second floor. There is no elevator service available, but assistance with your luggage is available upon request at the front desk. 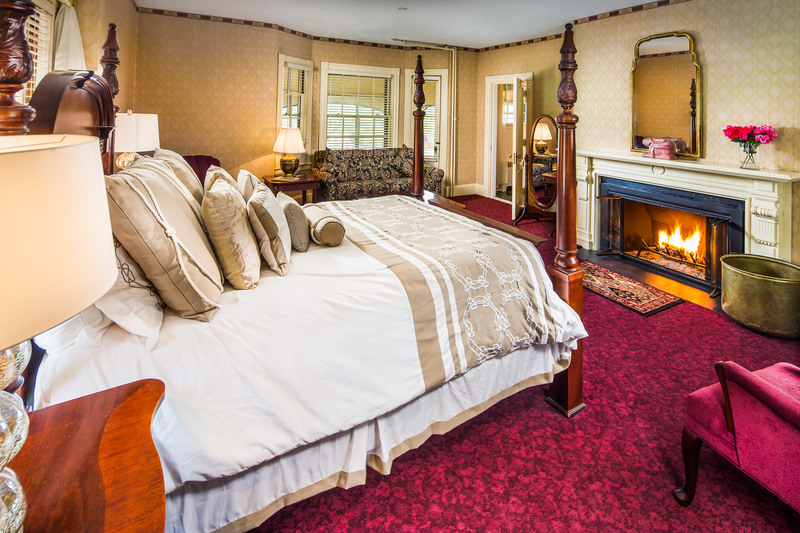 This cozy Victorian-style Manor room has one queen size bed, a flat screen TV, and a view of the grounds behind the Manor. The newly renovated bath has a shower only. Room size is 208 square feet or 20 square meters. Room 30 is on the third floor. There is no elevator service available, but assistance with your luggage is available upon request at the front desk. 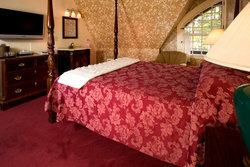 This Manor room has a queen-size four-poster bed, flat screen TV, and views of the grounds behind the Manor. 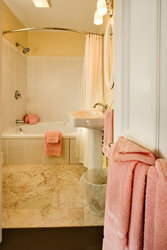 The newly renovated private bath features a shower and tub. Room size is 221 square feet or 21 square meters. Room 31 is on the third floor. There is no elevator service available, but assistance with your luggage is available upon request at the front desk. This Manor room has one queen-size four-poster bed in front of a wall-mounted flat screen TV and views of the Moat Mountain Range. The newly renovated private bath has a shower and tub. Room size is 216 square feet or 20 square meters. Room 32A is on the third floor. There is no elevator service available, but assistance with your luggage is available upon request at the front desk. 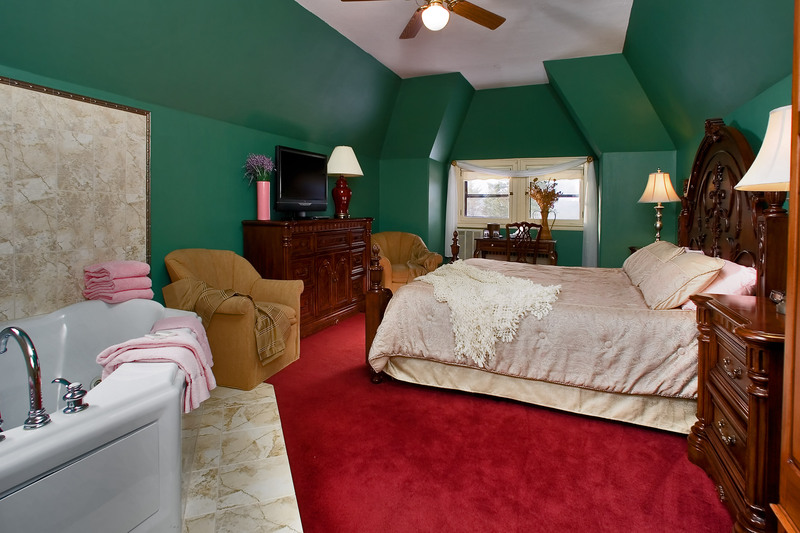 These three Mountain View Wing rooms each have one double bed and one twin bed, a private bath with shower and tub, wall-mounted flat screen TV, hardwood floors with area rugs, and private entrances from the parking lot side and the pool side. Room size is 266 square feet or 25 square meters. These three rooms also share a patio off the back of the room, which leads to the swimming pool, jacuzzi, gardens, and gazebo, all with a spectacular view of the Moat Mountain Range. Midweek (Sun. – Thurs. ): $156. Add $30 per night during foliage. Manor’s Best Buys – 3 Nights or More Midweek: $146. Weekend (2-night minimum): $166. 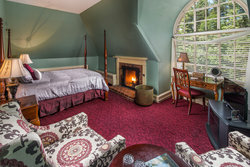 Add $40 per night during foliage. Holiday Weekends (3-night minimum): $176. Add $30 during President's Day & Columbus Day Weekends. Add $50 for New Year’s Eve. Please note: The Mountain View Wing has access to the main Manor House from the outside only. Rooms 1, 2, and 3 are on the ground floor. These two Mountain View Wing rooms each have a queen size bed, a private bath with shower and tub, a wall-mounted flat-screen television, hardwood floors with area rugs, and a private entrance. The view from both of these rooms is parking lot only. Room size is 266 square feet or 25 square meters. Midweek (Sun. – Thurs. ): $156. 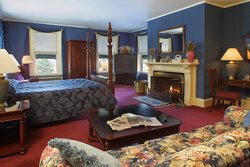 Add $30 per night during foliage season. Weekend (2-night minimum): $166. 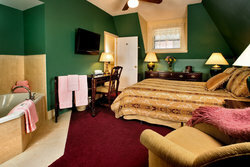 Add $40 night during foliage season. Rooms 4 and 5 are on the ground floor. These Mountain View Wing rooms have a private entrance from the shared balcony, which overlooks the swimming pool, gardens, and the Moat Mountain Range. 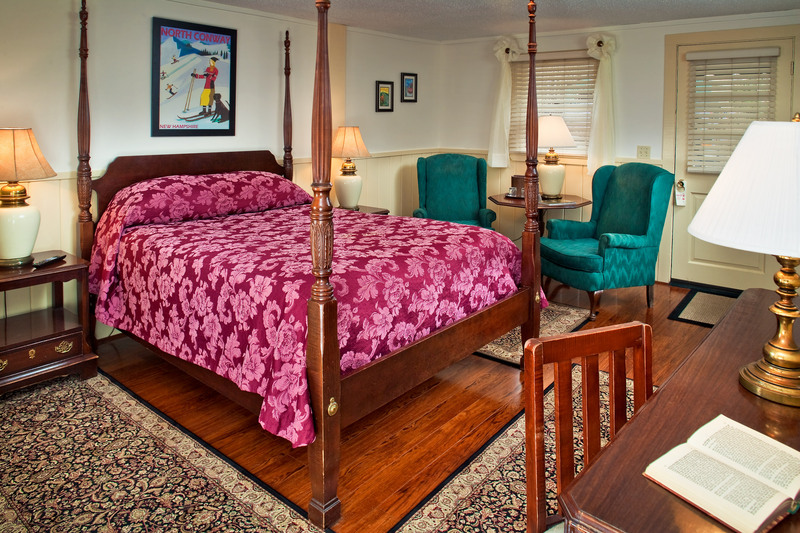 Each room has a queen-size four-poster bed, color cable TV, and a newly renovated bath. Room size is 266 square feet or 25 square meters. Rooms 6-10 are on the second floor. There is no elevator service available, but assistance with your luggage is available upon request at the front desk. These pet-friendly Mountain View Wing rooms have private entrances, private baths with showers and tubs, wall-mounted flat screen televisions, & hardwood floors. 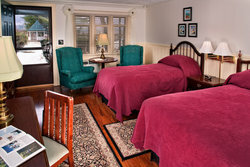 Choose from either a room with a view (one double & one twin in Rooms 1, 2, or 3) or a room with a queen bed and no view. Room size is 266 square feet or 25 square meters. We have treats for your pets when they stay with us. We provide size appropriate food and water bowls for your pets along with “Welcome Doggie Cookies” and waste bags. Holiday Weekends (3-night minimum): $176. Add $30 for President's Day Or Columbus Day Weekends. Add $50 for New Year’s Eve. Add nightly fee of $25 per pet to these rates. Pet-friendly rooms are on the ground floor. An additional nightly fee of $25 applies for your pet. Do not leave your pet in the room unattended. Even the best behaved will get anxious when alone in an unfamiliar setting.